Simulation of retro rockets in backshell firing seconds before Mars Exploration Rover lands on Mars. 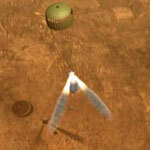 Simulation of Mars Exploration Rover bouncing on Mars inside its protective covering of airbags. On the phone, tones can signal a connection. On paper, they can add shape and dimension. On Mars, they can do both. This is why members of the Mars Exploration Rover Entry Descent and Landing team at NASA's Jet Propulsion Laboratory will be on the lookout for a series of tones during the mission's landings in January 2004. "Tones are a simple way to send information directly to Earth about what the rover thinks it is doing as it enters the Martian atmosphere and prepares to land on Mars," said Mars Exploration Rover Entry, Descent and Landing Telecommunications Lead Dr. Polly Estabrook. After the Mars Climate Orbiter and Mars Polar Lander missions were lost in 1999, mission engineers began looking at ways to strengthen communication during future landings. The Mars Exploration Rover team plans to use tones in conjunction with other methods to assess the state of the rovers shortly before, during and after landing. These tones cannot be heard, but they can be detected by special equipment located at NASA's Deep Space Network. The Mars Exploration Rover mission uses a radio called the Small Deep Space Transponder, which can generate tones at up to 256 different frequencies-more than enough to cover the possible states of the spacecraft, engineers said. Using data analysis equipment specially designed by a JPL team for the Mars Exploration Rover mission, the tones are presented as colored bars displayed according to frequency and received time. In addition, the detection software decodes the meaning of the tones and displays the names of various events associated with the tones. However, due to the extreme conditions of heat and speed during landing, there is no guarantee the tones will be detected-even if the mission is going exactly as planned. The process of entry, descent and landing on Mars is no walk in the park. It entails getting a 827-kilogram (nearly a ton) spacecraft, entering the martian atmosphere at 19,300 kilometers (12,000 miles) per hour, to safely slow to a stop on the surface in six nail-biting minutes. Complicating matters is the martian surface, which is plagued with unpredictable winds and obstacles: massive impact craters, cliffs, cracks and jagged boulders. During the first four minutes of descent, friction with the atmosphere slows the spacecraft to 1,600 kilometers (1,000 miles) per hour. With only 100 seconds left, and at the altitude a commercial airliner typically flies, a parachute opens to further slow the spacecraft to 321 kilometers per hour (200 miles per hour). With 6 seconds left, and at 91 meters (100 yards) above ground, the retro rockets fire to bring the spacecraft to zero velocity. Seconds later, the lander freefalls from a height of about four stories, cocooned in airbags to cushion the hard blow as it hits the ground at 48 kilometers (30 miles) per hour, or more if it is windy. The lander then bounces approximately 30 times from as high as a four-story building and down to a rolling stop. If the tones show up, they will keep controllers from being locked in limbo, unable to learn the status of the rovers until after the complete landing. While many events will occur during the landing process, engineers hope about 15 of those events to be signaled to Earth. Each rover is programmed to transmit a tone every 10 seconds to tell engineers on Earth about its progress. The first tones sent by the spacecraft will signal its deceleration as it enters the Martian atmosphere. Engineers could also receive a tone after important events such as parachute deploy, heat shield jettison and lander separation. Fault tones are also sent if the spacecraft thinks one of its subsystems is performing unusually. Once the lander has touched down, it will send five tones every 30 seconds to keep engineers informed about its health. As with any form of radio communication, many factors-- such as spacecraft antenna motion and atmospheric conditions-- can affect the quality and reliability of radio signals or render them undetectable. This is also true for the tones, which are also difficult to detect because of the spacecraft's motion during descent. "We engineers all understand that because these signals are so difficult to detect, an absence of them during or after landing does not necessarily mean that the rover has had a bad day," Estabrook said. In addition to the tones, rover engineers will strengthen their chances of receiving information about the spacecraft's descent onto Mars by waiting for information that has been relayed from the Mars Exploration Rover to the Mars Global Surveyor spacecraft. The rovers have been equipped with Ultra High Frequency radios, which they will use to communicate with the orbiter as they descend onto the Martian surface. These radios can transmit 8,000 times more information than the tones. However, due to the unknown geometry between the two spacecraft, engineers cannot guarantee that they will receive this data. Within an hour of each rover's landing, the data should be at available at JPL. "The Mars Exploration Rover team has gone to great lengths to improve the chances of receiving data from the spacecraft during this period of great activity," Estabrook said. "But we must be prepared to wait until at least the next morning, when the rover communicates with us, to get detailed information on spacecraft health and find out what exactly happened during descent."